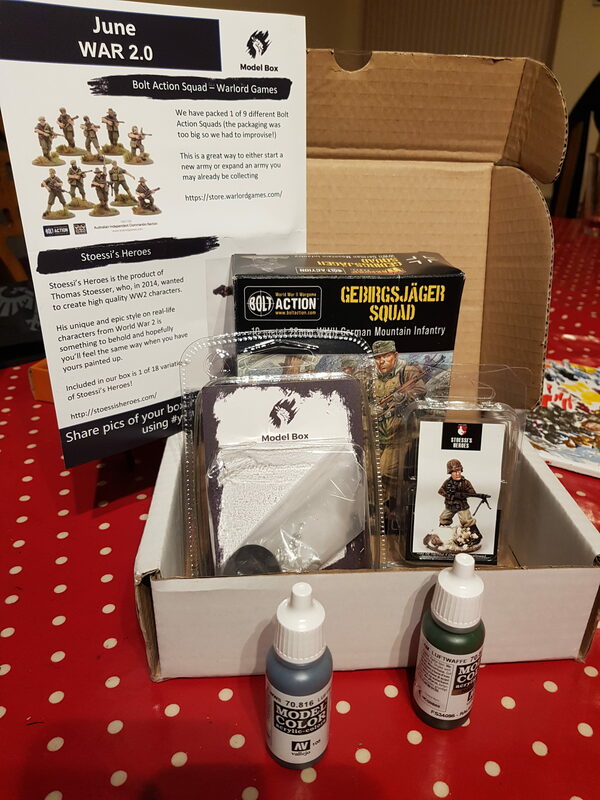 George from Model box has kindly sent us a box to review, we have spoken about it on our podcast, episode 26, but thought that we would write a review as well. We have both been interested in the monthly subscription boxes and so it was really nice to try one out first hand. We hope you enjoy this or at least find it useful! Please leave us feedback, we try to release the most high quality and useful content we can within our time constraints, your feedback will help us do that! What do model box say?! The best place to start is often looking at what the company say about its products..
Model Box is designed to introduce you to companies and miniatures you wouldn’t necessarily try or even know about! We theme each month on something different to allow you to get a real flavour of what the hobby industry is about! Sometimes you may even get Exclusives and Limited Edition Model Box Minis! So, lets have a look at the product and then come back to this statement. Every month we will send you a box packed with at least 1 awesome miniature and other great hobby items like a selection of paints and gaming accessories, basing materials, brushes which will all be based around a theme. I will focus on what I got in my box, Dan received a virtually identical offering but with different units. This months theme was “war” so we received a selection of world war 2 figures. I have listed the prices because I think this is useful later. The box also had an information sheet packed with information about these products. Always a big deal, so how much of our hard earned cash do we need to part with? SHIPPING: Shipping is not included in the price and will be £4.99 PER BOX for the UK & £9.99 for international shipping. As you can see above I calculated my box value at about £30. So the box is definitely value for money in the UK based on product alone, but the postage tips it internationally. These things, I think are a great offering. There is a phenomenal range of companies and products out there for hobbyists, and yet great companies can pass you by for years. I find a new company or product nearly every month, often for every new podcast we record (fortnightly), and these are very often companies that have been around for years and I simply have not come across them. I think that a company doing the legwork for you, not only opens your horizons to a world of excellent products but also adds in a wonderful element of surprise. It has to be better finding a new product by actually receiving it, rather that just seeing it on the internet, right? When I got my box, it was exactly like getting a present. I would expect that if you subscribed it would be a lot like getting a present from yourself every month! So what do we think of it overall? This product ticks a lot of boxes, it fulfils its objective completely and provides a range of products at a good price, with an X-factor that adds a significant value to the product. However, there is the problem that you may receive products that you have no interest in. I suspect overall that I would receive models every month that I would have enough interest in to want to paint, and the others would not be too hard to sell on or distribute to friends and family. We are both really impressed by the offering by model box, so much so that we took it to geekfest to talk to people about, and they seemed similarly impressed with the product. I suspect that it won’t be for everyone, those for example with a whopping backlog of models may find the concept of adding to that backlog monthly a bit overwhelming. However, I think that the joy of opening a “present” monthly, with all the excitement of opening that box and finding out what that month’s offering is, more than makes up for any reservations I had about this. So a hearty recommendation from us mighty listeners.